Taking summer online classes? Milne can help! Art, Music, and Food, Oh My! The Milne Library News blog is moving to a new home. You can find us here. For those of you who receive Milne Library News via RSS, you shouldn't see a change. Milne Library at SUNY Geneseo is in the midst of a Service overhaul that includes a major physical transformation of the Circulation, Tech Help, and Reference desks, scheduled to take place this summer. Our goal is to integrate our many service desks to a single service point manned by student workers and library support staff who will handle all unscheduled library queries ranging from check-in and check-out questions, to IDS and Tech help questions, to on-the-spot reference questions. Students and staff will be trained to handle any basic questions from our patrons. All questions that they may find themselves unable to answer will be referred to the appropriate department. The Reference desk will be transformed and expanded into an enclosed research area adjacent to the main service desk. This area will have all of the appropriate technology and other materials conducive to a complete reference interview. Scheduled research consultations , already a popular service with students and faculty, will be heavily promoted and are expected to continue to thrive and expand in this new model. For at least the first year, a reference librarian will remain on duty in this new research area available for walk-in reference questions. Training programs are being developed and implemented for both staff and students. Basic reference training has already been provided for the staff, and will continue to be provided as the physical changes to the service desk are implemented. Students will receive training in a classroom setting, on-the-job, and through an online course management system. All of this adds up to improving the services Milne provides for the College community. If you have any questions or concerns about this change, please feel free to leave a comment on this posting and we will respond. Milne Library is gearing up for the 2010 Summer session! We have created an online library guide to help students enrolled in online courses access library resources remotely. How to access books and articles. Including how to check out books and have them delivered to your summer location. Get research help using IM a Librarian: Milne library's instant message service. Research help using our Library Guides: we offer subject specific guides can be accessed through our Resources by Subject list on the library's homepage. Get one-on-one help from a librarian. Student Research consultations are available in person or in an online environment. These are just a sample of the resources we have to offer you. See our online library guide for more! We wish you much success in your online summer course. Should you need assistance in your research, librarians are available to help. Contact us now, or you can IM us right from the library guide as well. One of the things that Milne's librarians think about on a regular basis is communication with our users. It's not uncommon to see folks walking through the Library talking on their phones or furiously texting at lightning speed and this got us to wondering, "Is this something that we ought to incorporate as an option for our users?" And so we ask you, if Milne were to offer service through mobile phone technology, would you use it? Would you find it convenient to text a quick question to our staff? Tell us! It looks to be another scorcher in the library today with outside temps muggy and expected to reach the mid 70's. Since we, the staff, spend 8 or more hours a day in the building, we would love to be able to regulate the temperature. Unfortunately, the library staff has no control over the cooling (or heating) system for the building. Heating and cooling for all Academic and Administrative Buildings on campus is produced at the Heating Plant. Library administration has alerted Facility Services regarding temperatures in the building. In the mean time, we have fans running throughout the building to better circulate the air. If they aren't running, please feel free to turn them on! There’s lots of room to study in Milne, lots of leisure reading materials available to borrow, and lots of reference librarians around to help with last-minute research or citations. The entire staff at Milne Library wishes everyone a pleasant and relaxing summer! On Friday, April 16th, Milne transformed one small corner into a gallery and performance space for an audience of about 40-50. Several students provided their original artwork for display, including oil paintings, color pencil, photography, and pen & ink. There were several musical performances of jazz/blues, classical, and rock with acts performing sets of 15-25 minutes. There were even a few improv moments, including working on a new song with A+B2 riffing on a crowd-inspired "Library" theme. Catch a bit of the fun in this video! This event was used to raise funds for the Senior Class Gift. My Funny Valentine; guitar and voice. Ralph Vaughn Williams; violin and voice. What do you think? Should the Library host more events like this? Let us know! Day of Silence is a National youth-run effort using silence to protest the actual silencing of LGBT people due to harassment, bias and abuse in schools. Get more information, get resources and get involved at www.dayofsilence.org. Become a fan of Day of Silence on Facebook. This Friday evening, April 16th from 5-7 pm, the main lobby of Milne Library will be transformed into CLUB MILNE for an after hours party. The event will feature musical performances and artwork by SUNY Geneseo students. Coffee and cookies will be served and donations will be accepted for the Senior Class Gift. So bring a few bucks to throw into the hat and let's have a good time! 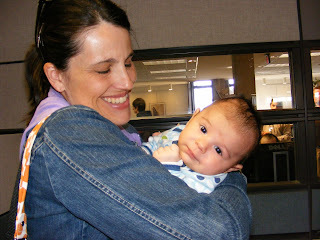 It seems like only yesterday that the staff at Milne Library was celebrating the birth of little Silas Goodrich, Collection Development Librarian Kate Pitcher's second son. The entire family, including big brother Griffin, are thoroughly enjoying their growing clan and life is busy and wonderful. We welcome Kate back from maternity leave and surround her with lots of support as she jumps right back into the swing of things by leading the library's first Faculty Luncheon. As the librarian in charge of book budgets and the lofty task of diversifying and balancing Milne Library's collections, Kate and her fellow library colleagues will host an informal lunch for faculty, comprised mostly of Department Chairs and Library Representatives, on Wednesday April 7 between 12-1:30. Topics to be discussed include scholarly publishing initiatives, material budgets and departmental allocations and a working document of collection development guidelines. We are so happy to have Kate back in the library!